Dubia Roach Starter Colonies contain 100, 250, and 500 Dubia roaches in mixed sizes ranging from newborn nymph to mature, breeding adult. 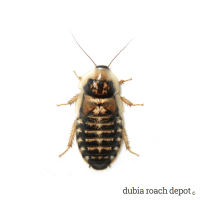 Get a new Dubia roach colony up and running fast with our Dubia Roach Starter Colony. Each size has a complete mix of Dubia roaches in sizes and stages representing what we see in successful, established breeding colonies. This means you get newborn Minis, breeding females measuring around 1-½ inch, and every size and stage in-between. For example, a 500 count Starter Colony contains at least 50 adult females, 10 adult males, and 440 nymphs of various sizes. We typically overstock orders by about ten percent to protect against loss in transit. However, problems are rare and you will probably end up with a few more roaches. 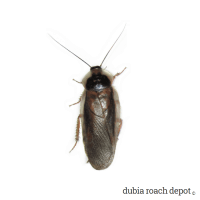 A Dubia Roach Starter Colony is a good choice for those who want to quickly build a breeding colony that will provide a constant, sustainable supply of feeders. As a general rule, Dubia are very social roaches. The more opportunity they have for interaction, the healthier they will be. This means that in a reasonably sized enclosure, larger numbers lead to healthier roaches. 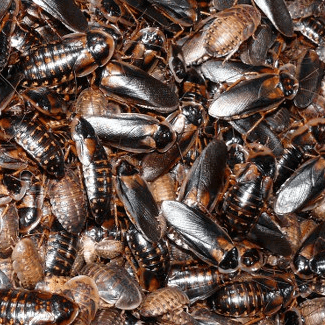 And because healthy roaches are productive roaches, the more there are, the faster they breed. And of course, faster breeding means faster colony growth. 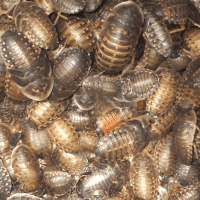 Just a handful of adults can create a complete colony in time, but Dubia roaches are most productive in larger, denser colonies with mixed nymphs like those occurring naturally in the wild. Because all the roaches in our Starter Colonies are organic-fed and professionally bred, they make exceptionally healthy and productive stock for breeding projects. Some of our adult females are huge! We focus on providing an ideal environment and nutrition so your future Dubia roaches will make great feeders. We’re so confident you’ll like our roaches that we guarantee them 100%. Where a new Dubia roach colony ultimately ends up depends largely on where it begins. That’s how it goes with roach nutrition. It’s cumulative, and not just with respect to the life cycle of each roach, but intergenerationally. The health of roaches that will exist three and even four generations from now depends on the roaches now! Get your breeding project started right. Start with our Dubia Roach Starter Colony!